There are 2 kinds of cards: DIGIMON cards and POWER OPTION cards. Digimon cards are the character cards that fight their battles in the DUEL ZONE. Power Option cards are used to enhance the power and flexibility of the battling Digimon cards. The cards are available in one complete STARTER SET. The Starter Set contains 62 different cards, a game mat, 2 score counters, and an instruction sheet. There are 48 different Digimon cards and 14 different Power Option cards. The cards in the Starter Set are identified by an ST- prefix to their card number. Digimon cards are divided into three BATTLE TYPES: (RED), (GREEN), and (YELLOW). The Battle Type of your OPPONENT is what determines your relative DIGIMON POWER. 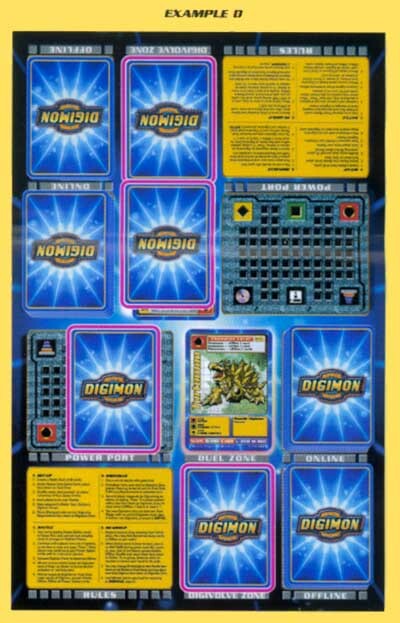 This relationship changes from card to card, as shown in the Digimon Power chart on each Digimon card. In general, (YELLOW) is more powerful than (GREEN), and (GREEN) is more powerful than (RED), but at times (RED) is more powerful than (YELLOW). You can think of this as similar to the relationships in "Rock, Scissors, Paper." They are further differentiated into four DIGIVOLVE levels. These levels are, in ascending order: ROOKIE, CHAMPION, ULTIMATE, and MEGA. The higher the level, the stronger the card. To Digivolve your battling Digimon to the next level, you must play a card that meets the DIGIVOLVE REQUIREMENTS. The Digivolve Requirements are shown in a box at the top of the card. POWER OPTION cards come in three types: DIGIVOLVE, FORCE FX, and POWER BLAST cards. DIGIVOLVE cards are used in the Digivolve Phase to evolve the battling Digimon to a more powerful state. Take a moment to read the EFFECTS described on the Digivolve cards. FORCE FX cards are used in the Battle Phase to change the COLOR of your Digimon Power  (RED), (GREEN), and (YELLOW)  regardless of the Battle Type of your opponent. POWER BLAST cards are used in the Battle Phase to enhance the battling Digimon in several different ways, depending on what is printed on the card. Take a moment to read the EFFECTS described on the Power Blast cards.